In 2003 the Croser family removed 1.3 hectares of the original Tiers Vineyard Chardonnay, planted in 1979 in the Piccadilly Valley as the first Adelaide Hills vineyard. The area was replanted with the French Bernard clones 76 and 95 on rootstocks on very close spacing and at only 0.5 meters above the ground. This unique section of The Tiers Vineyard produces earlier ripening, fuller flavoured Chardonnay than the 1979 old vine, OF clone Chardonnay on own roots across the centre road in The Tiers Vineyard. The heat summation for the 2016 growing season at the Tiers Vineyard in the Piccadilly Valley was an extraordinary 1539C days compared to the last 12 years average of 1235 C days. The 2016 heat summation is way ahead of the next warmest vintage, 2010 at 1360C days. 2016 vintage was uncharted territory for me even after 47 vintages. Despite the persistent warmth there were no extreme heat events and only 13 days between October 1 and April 30 exceeded 30c and only two of these exceeded 36C. The sugar levels were very moderate at 23 to 23.5 Brix, the acids surprisingly held up at 7.5gpl (2 grams of malic) and pH’s remained in control at 3.2. The Tiers 1.5m section was hand harvested on the 12th of March and so unique is this small area of Chardonnay that we made the decision to bottle it separately in the 2015 vintage and again in 2016. The Piccadilly Valley Chardonnay was hand harvested into 0.5 tonne bins. At the Tapanappa winery, the fruit was de-stemmed, crushed and must chilled to 2C on the way to the Wilmess Merlin airbag press. The cold juice was lightly pressed to tank and after gravity settling, the partially clarified juice and its fluffy lees were racked to French Vosges oak barriques, 33% new and the balance 1 and 2 use and allowed to ferment at the cool air temperature of the Piccadilly Valley autumn. The 2016 Tiers 1.5M Chardonnay was left on full lees in barrique until the summer when it was clear racked and prepared for bottling in mid February. 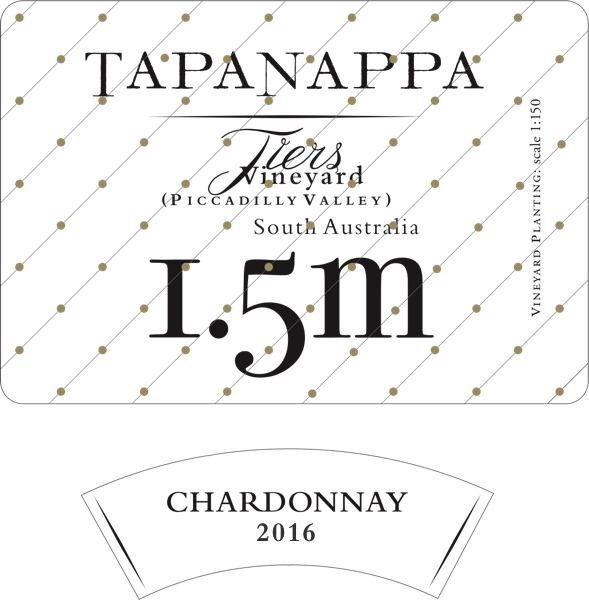 2016 Tapanappa Tiers 1.5M Chardonnay ripened early and fully because of the very warm growing season and the unique early ripening effect of the Dijon Chardonnay clones on de-vigorating rootstocks on close spacing and close proximity to the warm ground at night. Riper honey and fig characters complement the typical Tiers Vineyard peach flavour and aroma and significant texture. The Tiers 1.5M Chardonnay is softer and richer than the old Tiers Chardonnay from across the road. The wine finishes with a grapefruit and quince nuance again typical of The Tiers 1.5M Vineyard terroir expression. Bottled in February 2017. Only 360 dozen grown and made.